Lovers of fairy tales or stories full of fantasy starring knights, princesses and dragons have their corresponding replica of one of the elements that can not miss in these frames: El Castillo. As a key part of the medieval history of our country, the province of Leon has one of the most imposing structures that we find in its category. We talk about the Templar Castle of Ponferrada. The mass of stone is located on the city that gives its name to the castle, more specifically on the hill that combines the Boeza and Sil rivers. What makes it so special to Templar Castle in Ponferrada? At first glance it may not find any peculiarity, but it is precisely that detail, the fact away from the classical buildings to remind the style of the tales of heavy armor and on horseback spears making the site into a must visit. The Castle has several parts built in several centuries. For example, the northern part of the twelfth century date; while the rest have suffered all kinds of reconstructions going from the fifteenth century to the twentieth. As it regards its structure calls attention the main entrance, consisting of two towers and that tells us of the great door to the patio. In it we find on the one hand and on the left the courtyard; and the other an area dedicated to the defense of the Castle. Regarding the northwest facade find Moclín full prominence the tower. For the Templar Castle of Ponferrada they have passed all kinds of kings, and of course all kinds of battles happened that turned the building into an almost impregnable fortress from the XII century to the XV.However, and as a curiosity, Ponferrada Castle keeps its origins in Celtic construction, particularly in castrate; and soon after become a Roman citadel. Incredible true? It was not until the early twelfth century when the Templars took the Castle and thus making their particular and imposing fortress as we have today, albeit with occasional remodeling through. 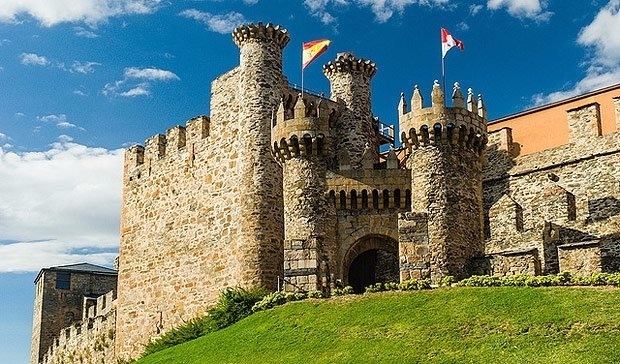 Another more than curious and unknown to many fact is that the twelve towers that make up the Castle reproduce the shapes of the constellations.Today, the Templar Castle of Ponferrada is a meeting point for those who want to know more as one of the most imposing fortresses in our country. Harboring the Templar Library, in addition to the Center for Research and Historical Studies of Ponferrada, the excuse to go to the site is twofold. Muy bien construido y conservado, ha sido un artículo de lo más ilustrativo. Bello es decir poco señores.